What is a Crochet-a-long? It is a super fun way to make a crochet project with a group of people all doing the same thing at the same time! There are deadlines so if you have a hard time finishing a project, the deadlines help you stay on track and actually finish! Also if you have questions, there are plenty of people to ask and receive help from! 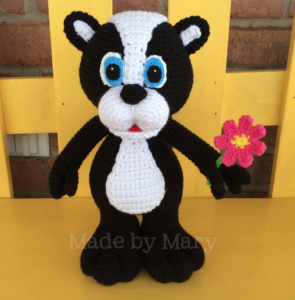 I have a great CAL group on Facebook Made by Mary CAL. Each month we have a new project. So far we have done several fun crochet projects. For the month of March there are 2 options: Buster the Bunny and Seymore the Skunk. Use coupon code: MARCHCAL to get 30% off either or both of these patterns through March 15. In the facebook group there is a photo album for each one. Here are the links to the albums: Skunk and Bunny. Each week complete the requirements and put your pictures in the respective album. 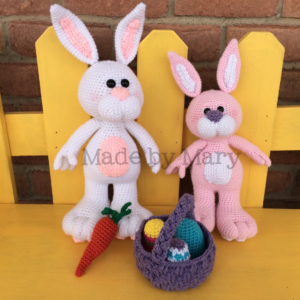 Random winners are chosen to receive free patterns. At the end, if you have completed your design on time and have your photo in the correct album, you will get a free pattern from my Ravelry shop! Come join the fun and CAL with us!